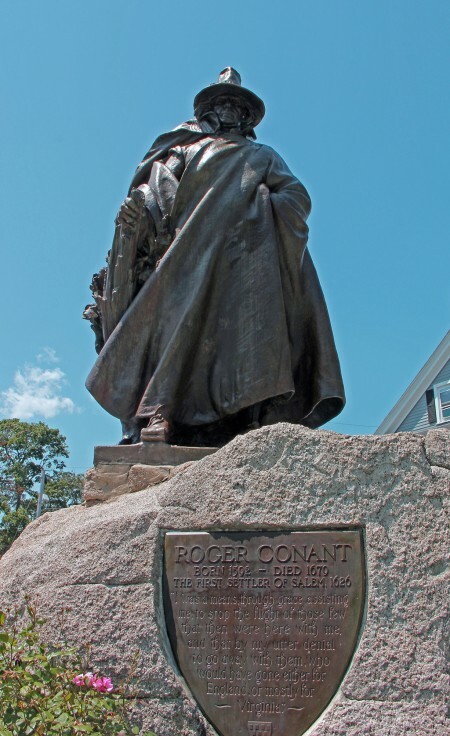 In 1626 Roger Conant, pictured below, led a group of English settlers away from the stormy Cape Ann coast in search of a new home, where day to day living would less of a struggle. They settled on fertile land at the mouth of the Naumkeag River, an 18 square mile area located on the Atlantic coast in Essex county Massachusetts. In 1629 the settlement was renamed Salem, a Hellenized form of ‘peace’, in Arabic, salaam, in Hebrew shalom. Conant’s competent leadership provided the stability for the settlement to survive the critical early years. In 1692 the daughter and niece of a local reverend became ill. A village doctor was called in when their illness lingered. He diagnosed the two girls as being bewitched. This put into motion forces that ended in the hanging deaths of nineteen men and women, the crushing death of one man, along with several other people who died in prison awaiting trial. The trials began in June of 1692 with the establishment of a special Court of Oyer Terminer (to hear and to decide) was established to hear cases of witchcraft. The court was disbanded in October of the same year by Governor William Phillips, and replaced by the Superior Court of Judicature. This court did not allow the admission of, so called, “spectral”, evidence, which was based on the belief that the accused had the power to torture their victims with invisible forces and shapes. The new court released those awaiting trial and pardoned those sentenced to death. The short but horrific era of the Salem Witch Trials was ended. 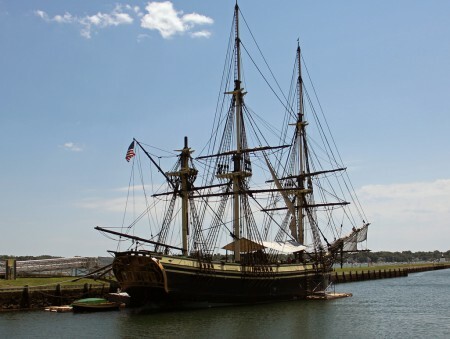 The Friendship of Salem is is a replica of the Salem East Indiaman, a 171-foot, three masted merchant ship, first launched in 1797. She was captured as a prize of war in 1812 by the British war sloop HMS Rosamond. This replica was based on a model at the Peabody Essex museum in Salem. As you can see, she is currently under renovation repair at the Salem Maritime National Historic site. However she is a fully operational sailing vessel that stays close to home so that everyone can come aboard. 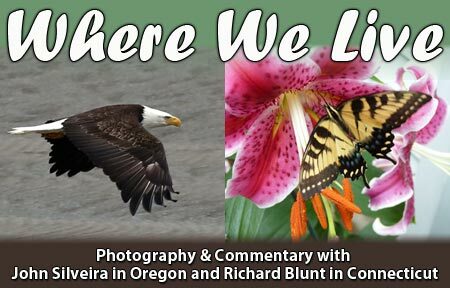 Ansell Adams traveled to many well known shoreline communities in Massachusetts. He took many photos of seascapes and other simple scenes. Four of these photos taken during his 1941 visit to Cape Cod are currently being shown at Peabody Essex Museum in Salem through October 8,2012. I plan to return to Salem again in September to see this exhibit. 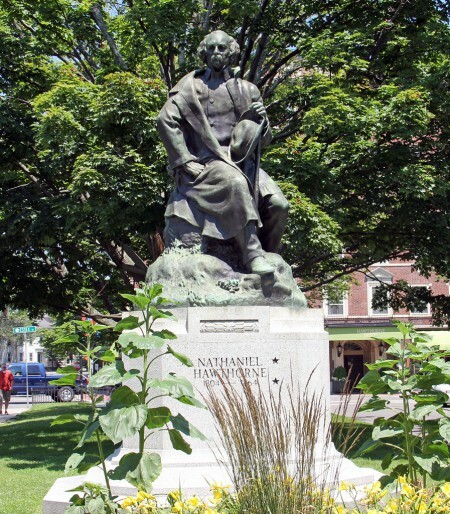 Hawthorne was born in Salem on July 4, 1804. He was a descendant of John Hathorne, one of the presiding judges at the Salem witch trials. In order to distance himself from his families participation in this shameful event, he added the w to his last name while in his 20s.He the searing novel, The Scarlet Letter. A story outlining the taboos of Puritan New England contemporary life through the travails of Hester Prynne who gives birth to a baby girl after an adulterous affair. The success of this book made it possible for Hawthorne to write, my favorite, The House of the Seven Gables. A story of a gloomy New England mansion haunted by fraudulent dealings, accusations of witchcraft and sudden death. This was great reading for a 12 year old kid looking for literary excitement outside of his programed parochial school readings . This granite and bronze statue sat in the Museum of Fine Arts, in Boston, until 1925 when it was transferred to this site in Salem on Hawthorne Boulevard. My wife Tricia, and my son Michael joined me on my Destination Salem adventure. We started our tour at Artist’s Row on Salem’s painted red historic trail. 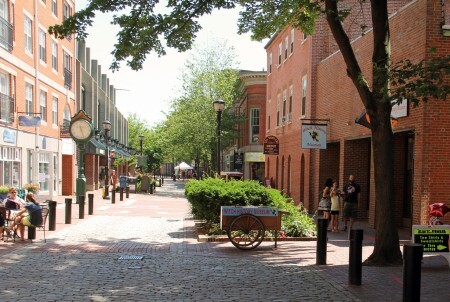 This is a pedestrian only street known as Salem Marketplace. 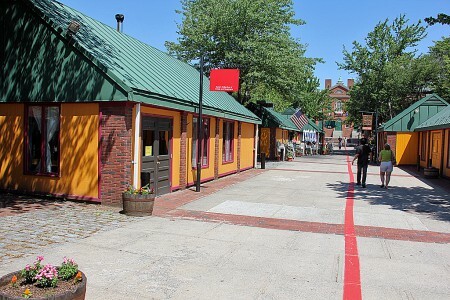 Following this red line leads us to many of the best known historic sites in Salem. You can see Tricia and Michael walking ahead as I stop to take a few shots. Artist’s Row was introduced in 2004. It provides free rent to artists. In exchange the artists provide free public workshops and entertainment throughout the season. For visitors that prefer riding. 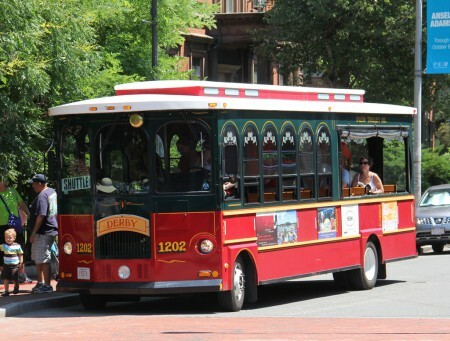 Salem offers hourly Red Trolly tours ever hour from 10 am to 5 pm. These tours are conduct by professional drivers along with a knowledgeable tour guide. 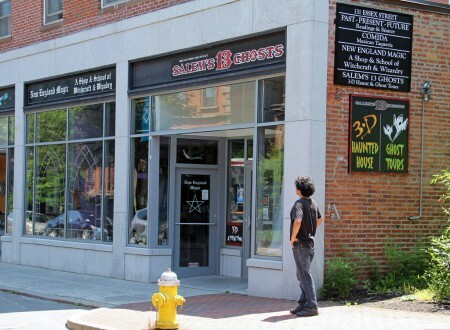 On the tour you will learn much of the factual history along with many entertaining tidbits about Salem. 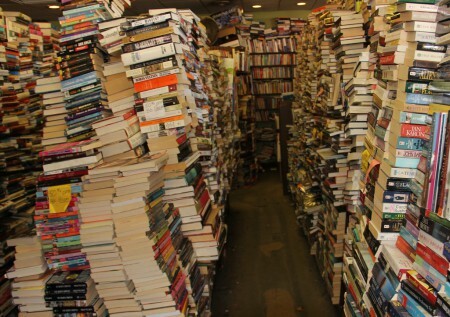 Pictured above is the interior of The Derby Square Book Store. If you like to read and looking for a new or out of print book at a great price, this store alone is worth a tour of Salem. The owner of this shop says that he often buys the contents of other books stores going out of business. When he asked me what attracted me to the store. I confessed that it looked like my son Micheal’s bedroom when he is home . The cash register is behind the book stack on the near, right side. The Witch History Museum, shown above ad below is one of the best commercial museums in Salem. It does a great job telling little known stories of the region during the witch hysteria period of 1692. It does so with a mix of insightful historic commentary and lurid thrills presented through a series of spooky dioramas in the basement. 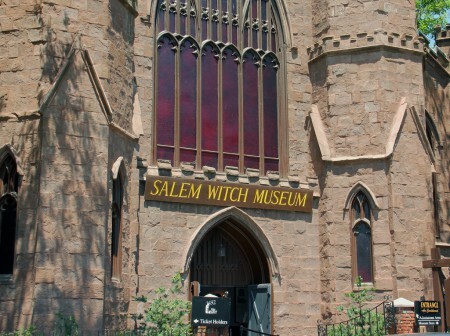 This museum also has a great gift shop filled with interesting Salem witch treasures. 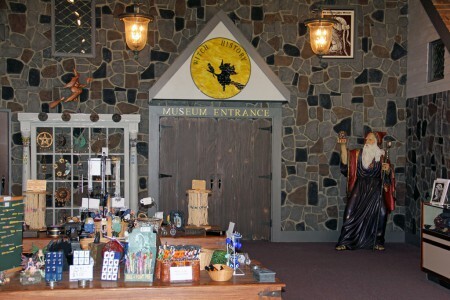 Front lobby entrance to the Witch History Museum. Inspired by the growing interest in Salem’s witch trials, generated by Arthur Millers masterpiece, The Crucible. 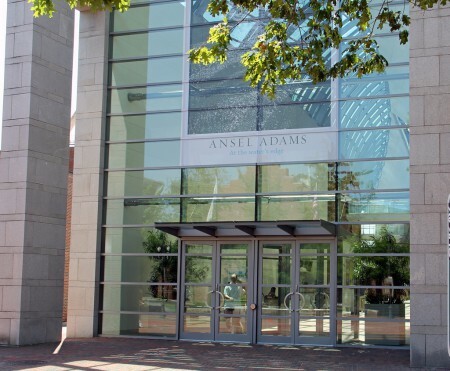 The Salem Witch Museum opened in 1972 to provide a unique and accessible learning experience to the residents of Salem. It is prominently located opposite the Salem Common and is one of the most popular attractions on Boston’s North Shore.